The United States continues to tacitly support Saudi Arabia and the United Arab Emirates’s military campaign in Yemen even as the country implodes, Iran’s influence grows and U.S. allies sink into the quagmire. The United States calculated that supporting its allies in favor of preventing Iranian encroachment offers more value than the fallout from the humanitarian crisis. Yet, the newest operation over the port of Hodeidah offers the United States an opportunity to push for peace negotiations. When the Saudi and Emirati intervention began in 2015, the Obama administration neither wholeheartedly embraced it nor strongly opposed it, eventually settling into a lukewarm embrace. At the same time, the United States was engaged in its own mini-war in Yemen, where it had been hunting terrorists since 9/11. In 2002, the United States killed al-Qaeda terrorist Salim Sinan al-Harethi, a Yemeni national, in the first drone strike outside a designated war zone. U.S. efforts continued fitfully in the years that followed. However, the Obama administration stepped up operations when al-Qaeda’s branch in Yemen, known as al-Qaeda in the Arabian Peninsula, tried, and almost succeeded in, bombing an airplane over Detroit in 2009. In 2011, the United States launched the first (and only) drone strike that deliberately targeted a U.S. citizen, Anwar al-Awlaki, who operated out of Yemen. Today, U.S. special operations forces work with the UAE to target al-Qaeda and Islamic State fighters in Yemen and the also conducts drone attacks.Additionally, they are beginning to help Saudi Arabia locate Houthi missile bases and stockpiles. Under Obama, the United States followed an often-confusing policy in Yemen, attempting to balance humanitarian concerns, a sense that the intervention would fail, and a desire to please Saudi Arabia and the UAE. Those allies see Yemen as a key regional issue because they worry about Iranian influence there, and by tolerating their intervention, the United States does them a favor in a country with historically low U.S. interests. Indeed, U.S. support proved vital for the military intervention to continue. Quietly, the United States—along with France and the United Kingdom—provides intelligence and air refueling along with other logistical support. The International Crisis Group described U.S. policy in Yemen as a “yellow light,” an indication of U.S. ambivalence, that allies blithely ignored, recognizing that U.S. backing would still be forthcoming. At the end of his administration, Obama gave the Saudis a symbolic wrist slap, temporarily halting the sale of smart bombs to the Kingdom because of the war and the repeated Saudi military mistakes that led to the deaths of many Yemeni civilians. In the end, both supporting and opposing the war failed and proved the worst of both worlds, frustrating allies yet doing nothing to stop the intervention or improve the humanitarian situation in Yemen. For the Trump administration, the Saudi relationship is particularly important, and he quickly lifted the Obama smart-bomb ban. Although he cares little about Yemen, Trump responded positively to Saudi and UAE efforts to court him and embraced their view of Yemen. He noted, correctly, that the Saudi-U.S. relationship was “very strained” under Obama, and Saudi Arabia’s leaders seem to be among the few foreigners that Trump likes. However, the Trump administration’s first foray into Yemen was a botched raid by special operations forces seeking terrorists in a Yemeni village , which led to the death of a U.S. Navy SEAL and, according to the villagers, around 25 civilians including nine children—hardly an auspicious beginning. In the end, the Trump administration has not veered too far from Obama, most recently rebuffing a request to join the current UAE-led offensive on the strategic port of Hodeidah. The Hodeidah operation will likely push Yemen’s humanitarian situation from nightmarish to something worse, both because of the fighting and the likely slow (or nonexistent) post-conflict reconstruction. Millions of Yemenis are on the edge of survival, and even temporary disruptions in food supplies would push them over. The Houthis, who torture political opponents and are often indifferent to the misery of many Yemenis, have an incentive to play up the suffering to pressure their enemies. The UAE promised to address the humanitarian crisis that their military operation exacerbates, which shows progress. International actors should press the UAE and Saudi Arabia to make good on that offer. The United States should abandon the “yellow light” policy in Yemen in favor of a “red light” policy. The tally between costs and benefits of supporting the Saudi and Emirati intervention falls decidedly in the costs category. The allies’ approach is self-defeating. Iran is stronger in Yemen than it was prior to the intervention in 2015. Al-Qaeda in the Arabian Peninsula has at times capitalized on the chaos to expand, and the group remains robust despite Emirati and U.S. efforts to fight it. 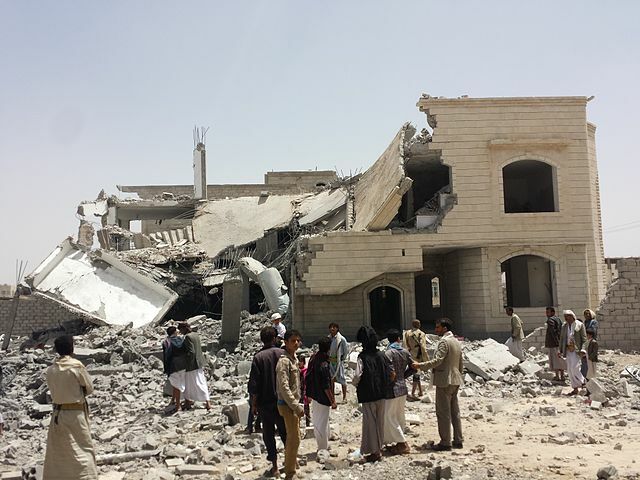 The UAE and Saudi Arabia spent tens of billions of dollars on the war; yet now many Yemenis hate them for the war’s destruction. Even with a victory in Hodeidah, the war will drag on. Further, the “yellow light” policy—coupled with the Trump administration’s strong embrace—empowers Saudi Arabia and the UAE to take self-defeating steps. This ranges from his strong rhetorical support in general, to extensive back channels with these leaders, to taking their side in their dispute with Qatar to his withdrawal from the Iran deal. Together, the Saudis and Emiratis perceive these gestures as indications that he does not care about Yemen and will follow their lead in the region. Ironically, Trump may need the Saudis and the Emiratis less than Obama did. Obama relied on Saudi Arabia and UAE to play a role in the coalition against the Islamic State, but the coalition has been steadily winning since 2015 and drove the caliphate underground. Notionally, Trump needs the Saudis and Emiratis in his Middle East peace plans, but the plans are deeply unrealistic and unformed, lacking buy-in from the Israeli or Palestinian sides. Even on a Yemen-specific level, the United States has influence—it just won’t use it to change the situation in Yemen. As Alex De Waal argues, the in-flight refueling, presence of advisors, and arms sales all offer U.S. leverage. Although the Trump administration will not likely seize it, the Hodeidah operation offers an opportunity to renew negotiations. Negotiations to end the war have failed repeatedly due to the numerous groups fighting in the conflict, which makes it hard to bring everyone to the table; the many divisions within them and the foreign powers’ lack of control over many of their proxies. However, promoting peace is still worthwhile given the grave situation in Yemen. If U.S. allies stop their campaign, the scope and scale of the violence might decrease. Moreover, if they win in Hodeidah, U.S. allies can enter negotiations with a mark in the win column, giving them political cover for reducing their interventions while their Houthi opponents would be more eager for a deal. The United States should support the efforts of Martin Griffiths, the United Nations’ envoy to Yemen and welcome new mediation efforts, perhaps by countries like Oman that can be an honest broker. Yemen will still have a long way to go on the road to peace and stability, but at least it would be heading in the right direction.